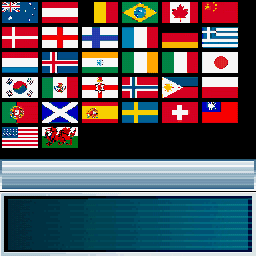 These are various graphics that can be found inside the game's disc. 2p VS mode graphic Unused 2PVS menu system texture. Text These probably go over the top of the previous graphics to make the menu selection. It seems that ??? was used to cover the menu selection for "All" until it is unlocked. 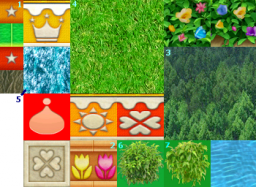 In the final game nothing is shown shown until it is unlocked. 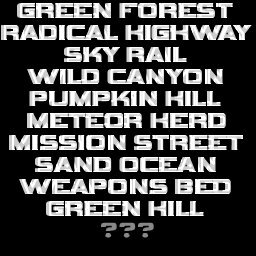 Mode Select Graphics Leftover graphics from Sonic Adventure 2 (Preview). 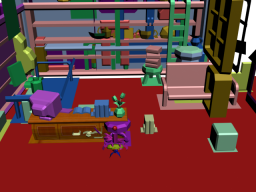 In certain cutscenes, Big the Cat is viewable via pressing buttons at a certain time. For example, in the Dreamcast version of the game, In the cutscene after fighting Knuckles/Rouge, press and again and again to make Big appear and walk around. Big also makes an appearance hidden in each stage. 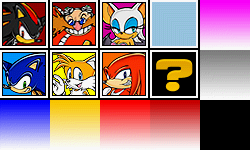 In fact, his appearances were so obscure that the development team for Sonic Adventure 2: Battle seems to have forgotten to port him, with many of his former spots being occupied by placeholder objects (Pointing to Rings) using his object ID. 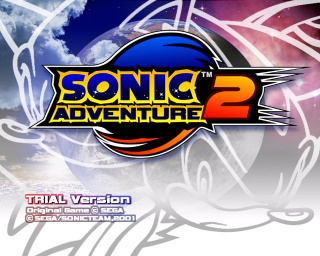 Leftover menu elements and screens from Sonic Adventure 2: Trial Version. 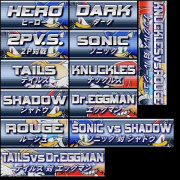 Green Hill is listed among text for 2P vs. stages. In-game however, the list doesn't scroll down this far. If it's forced to do so, Green Hill can be selected and is fully functional as a 2 Player stage. Early menu system in English and Japanese. 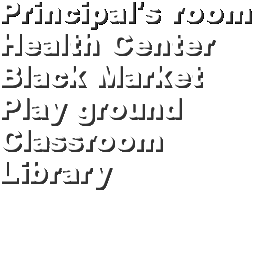 Note how Playground and Library are listed, but were not a part of the final game. 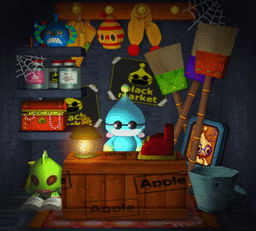 The Black market was also unused in this game, but were used in the updated GameCube port. 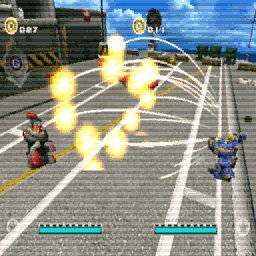 A Black market was actually available in the Dreamcast version but was only accessable on a website. These graphics were used for another menu system. Rather than drawing out the text the text would have been placed on top of these. May have taught about Knuckles' special moves in multiplayer. 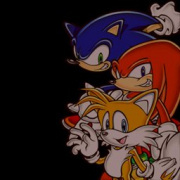 May have taught about Tails' special moves in multiplayer. May have explained how to use the Mystic Melody. Used to possibly explain about how to pick up objects. There are a few remnants of a World Ranking system in the game disc. It was in Sonic Adventure but it was left out of this game. The following text could be found in Advertise.prs. advsng_3.adx refers to the regular menu music which would have been used here also. 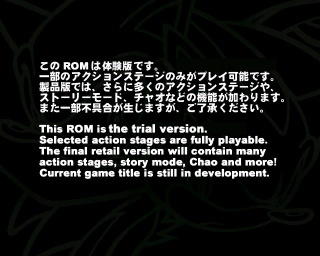 After further digging in the disc more text is revealed which would display onscreen. There was a login and registration (probably to reduce cheating). The rankings could have been searched by country and name. 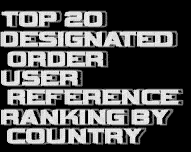 It referred to the world ranking system as "The Sonic Network." The text was translated into numerous languages such as French, German, Japanese, Spanish. Press Y-button to update data. fee and ISP connection fee. with the Dial Q2 system. Unable to connect. The line is busy. Disconnected due to no activity. 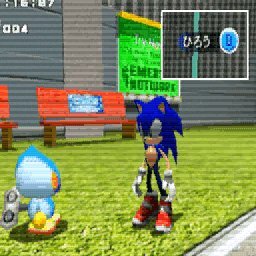 Now connected to the Sonic Network. number <++> in total ranking. number <++> in <++> score attack. number <++> in <++> time attack. number <++> in emblem ranking. No E-mail setting on Dreamcast. Email settings. Are you <++>? Welcome to the Sonic Network. want to use this user name. If you don't, select "No". rules of the Sonic Network. Display ranking from the top. Search ranking by user name. List ranking by country or area. Enter ranking you want to see. Enter user name you want to search. You can see user information. The menu in the first picture indicates the presence of a Black Market. 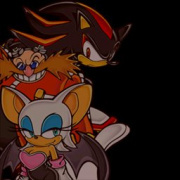 The second picture was actually from Sonic Adventure 2's website. 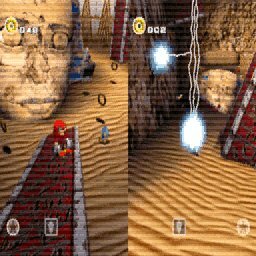 The textures shown in the third picture were extracted from AL_STG_KINDER_BL_TEX.PRS on the game disc. The first picture shown can be found in-game and provides solid proof of a Chao Playground existing at some point. The second picture actually shows some textures which were extracted from AL_STG_KINDER_PL_TEX.PRS on the game disc. 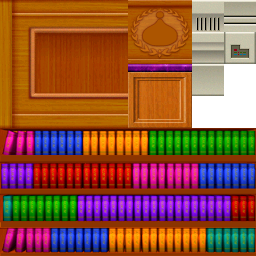 These images show an unused Library for the Chao Kindergarten. 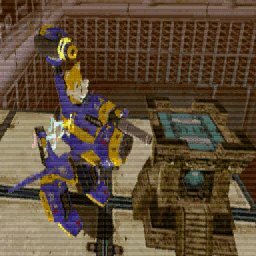 The models are found in CHAOSTGKINDER.PRS and the textures in AL_STG_LI_TEX.PRS. 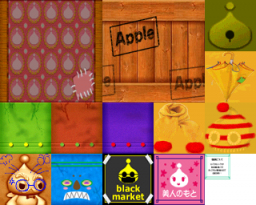 The following images show various themes which can be found on the disc, but are not usable. Hidden inside the disc is early maps of various levels. 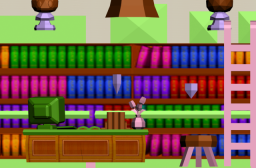 These maps don't go into very much detail and in a few cases disagrees with the level layout found in the final game. There is a debug menu in all versions of the game which is accessible by hacking. 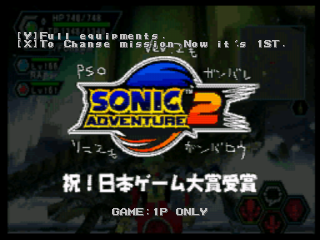 In the Dreamcast version, you can replace ADVERTISE.PRS with TITLE.PRS. In the PC version, you can use a memory editor to go to 434687 and change CC 76 8B 00 to 98 8F 8B 00. 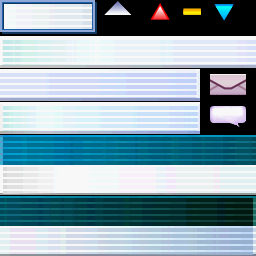 The code to display the menu items onscreen was removed in the PC version, but it still functions. GAME:1P ONLY - Play a level with one player. GAME:2P 3POINTS MATCH - Play a level with two players until one player wins three times. GAME:2P 1POINT MATCH - Play a level with two players. DEMO:1P ONLY - Record a demo with one player. Press Start to end the recording. DEMO:2P - Record a demo with two players. Press Start to end the recording. PLAY:FROM HERO - Play the story mode on the Hero story. PLAY:FROM DARK - Play the story mode on the Dark story. PLAY:FROM LAST - Play the story mode on the Last story. The GAME and DEMO options will ask you to choose a character or character set and a level. 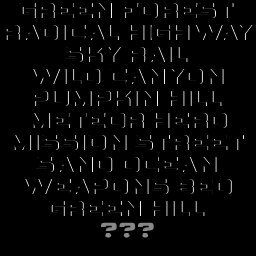 The list of levels includes all that character's normal stages, the test level (listed as BASIC TEST), Chao World (misspelled as CHAO WARLD) and occasionally SONIC TEST or KNUCKLES TEST, which do not exist in any released version of the game, and crash if you try to select them. 1st Mission: Make sure we debug this! 2nd Mission: Find 100 bugs! 3rd Mission: Find bugs that you couldn't find! 4th Mission: Debugged in 2 minutes! Last Mission: Try bug 0! 1st Mission: This stage is cool! These texts can be seen ingame via RAM editing in the PC version. 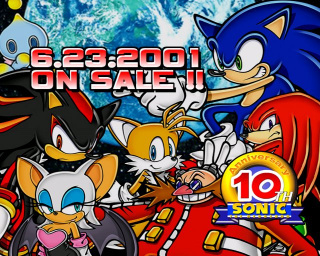 NOTE: The following information applies to Sonic Adventure 2: Battle only. 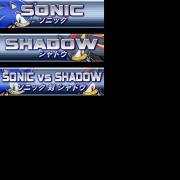 Within the game's text, there are lines indicating that Super Sonic and Super Shadow were meant to be unlockable characters in the game's 2P Vs. mode. You've cleared Green Hill with Rank A.
to use in Sonic and Shadow 2P versus mode. 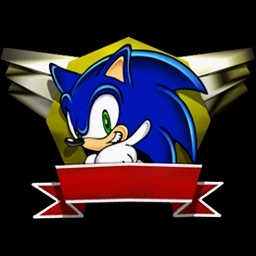 In the final game, completing Green Hill with an A rank doesn't give you anything. but dies if rings are lost. These lines are similar to the descriptions for the other characters in 2P mode. Looks like this Chao likes Amy a lot. Looks like this Chao likes Amy. Looks like this Chao wants to be friends with Amy. Looks like this Chao doesn't like Amy. Looks like this Chao hates Amy.